Boat insurance is known by a couple of different names. Boats are known more for how they are used than whether they were designed to float on water. For example, pontoon boats are a style of boat. So is a runabout. Bass boats are another kind of boat and again, it is largely described by the type of user. Yachts might be the boat that epitomize our luxury ambitions but boats is certainly a large target of on the water crafts. There are several types of boats that we encounter in our daily boat insurance lives. Classic Boat Insurance, Vintage & Collector – Insurance especially for well maintained or restored older boats of venerable designs. Many homeowner policies have the flexibility to insure boats but I usually suggest that boat insurance be obtained separately from home insurance property. Part of the reason is the limitations that homeowner policies place on the type and size of boats that are acceptable, but home policies do not specifically include coverage for salvage costs, wreck removal, pollution and environmental consequences. There is also the potential to territorial limitations to where you can use your boat when it is insured on a homeowner policy form. By the time we get done considering some of the potential problems with boats insured on homeowner policy forms, we get back to the real question and that is, what kind of boat insurance coverage should a boat owner buy for their needs? Insurance for boats are underwritten to a large extent by the operator driving record. If you have a less than stellar record on auto insurance, expect higher rates on your boat insurance. It isn’t beyond the realm of reason to expect some people cannot buy boat insurance at the best rates with any significant driving or claims history. After we get past the operators our underwriters have real concerns with things like the age of the boat, length, insurance value, speed and horsepower, condition, how it is used, has it been modified, how many owners, and where it will be operated. Some boats, based upon these and a combination of these factors, may require a boat survey and this requirement ranges from a simple questionnaire to a full-fledged inspection by a marine inspector. As boat insurance underwriters, we are always keen to identify the additional hazards in the boat, operators, or environment it is used so expect underwriting to be tighter than on auto insurance. The types of coverage that can be obtained is also going to vary based upon the type of boat and the value of the boat. Most boat insurance limits will be based upon the “actual cash value” or the depreciated value at the time of the loss. The other most prevalent method of valuation is what we refer to as “agreed value” and agreed value coverage provides protection to the boat at the amount stated in the policy documents. There is no depreciation subtracted or considered from the loss and this form of coverage is more expensive but gives a great degree of certainty that the boat value paid will be set. As your boat ages there may be a time when the boat underwriter will insist upon coverage based upon ACV rather than the “agreed value”. In determining the amount of boat insurance to purchase, we separate the hull from the motor and consider the value of each separately. We usually specify these separate values on the insurance documents. We then should consider the permanent equipment that stays with the boat. Some examples of this type of equipment include fishing outriggers, radio navigation equipment, and similar devices. These can be added to the hull and motor values when endorsing the boat insurance policy. The perils most often used for boat insurance policies are usually referred to as comprehensive coverage and collision is added to the comprehensive rather than specify it as a separate peril as we do with auto insurance. Like auto insurance, we will need to include boater’s liability coverage on your boat insurance policy. We then may also have to specify whether liability is included for towed skiers. Uninsured boater insurance is available and is a good recommendation for coverage and it acts similar to the uninsured motorist coverage on a personal auto policy. Towing coverage is also available when you need assistance returning to a dock, slip or place of mooring. With boat insurance, territory is generally restricted based upon the predominate type of navigable waters where you usually operate. We also use territory to help generate a rate on boat insurance policies. You may also be restricted to the distance from land on ocean navigation, be restricted to USA water areas (usually within 12 miles of shore), and restricted from travel in Mexican or the water territories of other countries like Canada or Caribbean nations. 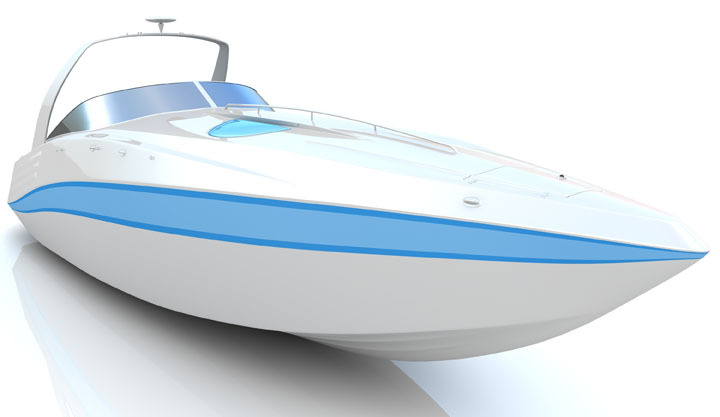 In boat insurance rate making, boats are characterized also by their propulsion systems. Of course, sailboats use wind to move the boat except when precise control is needed. Then sailboats rely upon small pusher motors. But there is also other types of engine drive systems. Outboard motors – Motors are not inside the hull but hang on a transom at the rear of the boat. The engine and drive system (prop) is external to the hull. Inboard Outboard systems (I/O) – The characteristics of an I/O system is the engines are mounted inside the hull and the outdrive-transmission is outside the hull below the transom area. Inboard Engines of Gas and Diesel – The engine and drive systems are largely inside the hull except for the prop system. Water Jet propulsion – A marine jet drive propulsion system draws in water under the boat and expels in at the rear of the watercraft to generate propulsion from the stream of water ejected by the nozzle in the drive system. This is the drive system in most jetski PWC type boats. Pod Drive systems – Pod drive systems are relatively new and are most similar to Inboard watercraft where the engine and transmission are inside the hull. Pod systems provide greater maneuverability because the thrust system can be directed under the watercraft. Because of design considerations these systems provide a highly efficient horsepower to thrust ratio and often are navigate-by-wire systems that are often controlled by sophisticated electronics. I have spent much of my life within an hour or two of the Great Lakes in Michigan and Ohio. I have been around boats all my life and find the allure of a peaceful weekend or early morning fishing to be a reward for working hard every day. In the Midwest we are blessed with great natural resources for boating and recreation and I stand ready to assist you in your boat insurance questions and insurance needs. You can reach me Monday through Friday, from 9-5 most days for your questions at (513) 779-7920. Other hours by appointment, and of course, I’m available 24 hours a day for emergencies.